The ability of doctors to correctly diagnose a patient is one of the most critical components of successful medical care. All events that occur from that point on are dictated by the diagnosis the physician makes. Current diagnosis modality is a result of Q&A with the patient regarding symptoms, taking of vital signs, and other tests such as blood work, MRIs, or CT scans. Such diagnosis is conducted with snap shot information taken in an artificial setting. This approach is prone to errors due to the natural variability in the physiological parameters that are being monitored and does not allow physicians to assess transient, episodic symptoms that often leave patients with irreparable physical damage. Technology that provides real-time continuous monitoring of a patient's state of health would provide physicians with information leading to a more realistic picture of a patient's lifestyle and thus enable doctors to diagnose more accurately. With the advent of implantable intervention devices (e.g. implantable cardioverter defibrillator) and in vivo sensors (e.g. 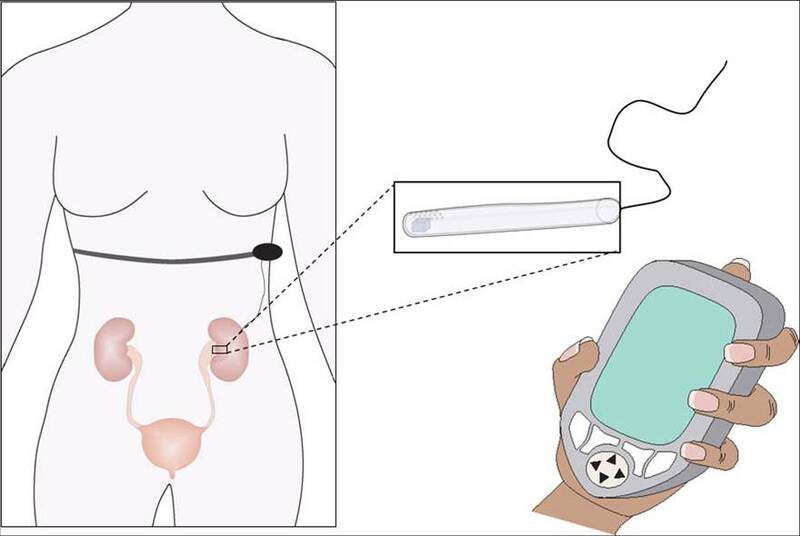 continuous glucose monitoring system), patients have enjoyed the immediate benefits of constant monitoring in many areas including sudden cardiac deaths reduction and diabetic patient lifestyles improvements. Building on the preliminary success of closed-loop monitoring, our next step is to enable simultaneous gathering of patients' long-term vital signs and physiological information in a natural environment. Our approach is to develop an implantable sensor network based on distributed network technology and in vivo sensors. Our system has three components: 1) miniaturized sensor module encases and protects the various physical and chemical MEMS sensors in a biocompatible package; 2) sensor node contains our power supply, signal conditioning circuit and wireless transceiver, and 3) PDA provides the communication hub where testing parameters are managed and physiological data are stored and displayed. Individually each sensor module can independently record critical vital signs and physiological parameters of the monitored system. Together, the distributed sensor network acts as a collective monitor of systemic symptoms. Based on our database, we may assess valuable interrelated effects of physiological profiles under specific perturbations not possible before. Our first generation of this concept is a minimally invasive implantable pressure sensing system to assess the gross pressure change in the bladder and renal pelvis per degree of ureteropelvic obstruction. 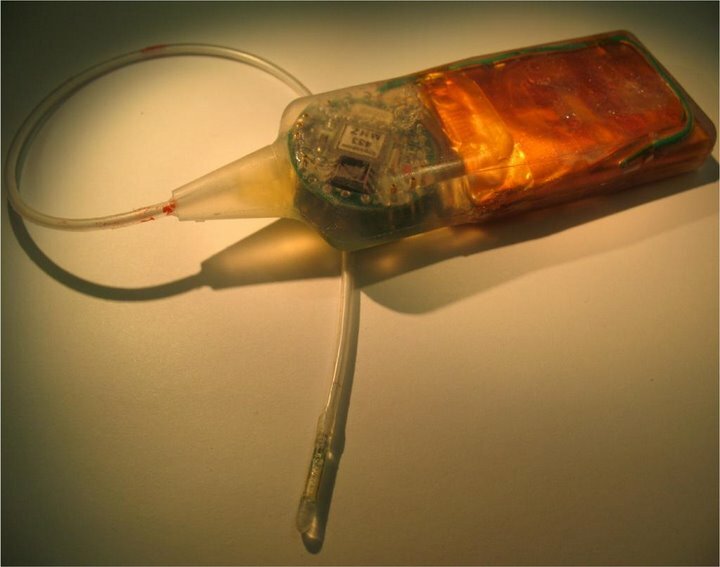 Our sensor module, which can be adapted for other types of physiological sensors, is connected by an 8F catheter to the sensor node. The node has multi-input/output channels, quarter-sized form factor, 433MHz transceiver, and programmable power states suitable to extend measurement periods after initial trauma. Our PDA identifies, receives, stores, and displays individual sensor node signal. It also provides a communication interface where users may remotely monitor and program the sampling rate, on/sleep/off period of the distributed sensor nodes. Current work is being done on a very small pressure sensitive catheter (1-2 French), as well as a pH sensor/glucose sensor/CO2 sensor. Lin, C.K., Jea, D., Dabiri, F., Massey, T., Tan, R., Sarrafzadeh, M., Srivastava, M.B., Schulam, P.G., Schmidt, J., Montemagno, C., "The Development of an Invivo Active Pressure Monitoring System," 4th International Workshop on Wearable and Implantable Body Sensor Networks , March 2007. Dabiri F, Jea D, Lin CK, Sarrafzadeh M, Srivastava MB, Schulam PG, Montemagno CD, "Development of miniaturized and ambulatory pressure monitoring system," 2006 UCLA Engineering Review, Los Angeles, CA, 5 May 2006. Lin CK, Schulam P, and Montemagno CD, "Smart catheter: Ultraminiaturized direct pressure monitoring system for urological applications." UCLA Bioengineering Departmental Symposium, Los Angeles, CA, 9 April 2005. Lin CK, Dabiri F, Jea D, Sarrafzadeh M, Srivastava MB, Schulam PG, Montemagno CD, "Development and application of miniaturized and ambulatory pressure monitoring system," World Congress 2006, Seoul, Korea, 27 August 2006. Lin CK, Dabiri F, Jea D, Sarrafzadeh M, Srivastava MB, Schulam PG, and Montemagno CD, "Development of minimally invasive ambulatory pressure monitoring system," SMIT 2006, Monterey, California, 11-14 May 2006. Lin CK, Jea D, Dabiri F, Massey T, Tan R, Sarrafzadeh M, Srivastava M, Schulam PG, Schmidt J, and Montemagno CD, "The development of an in-vivo active pressure monitoring system," Body Sensor Network 2007, Aachen Germany, 27 March 2007. Tan R, "Development of an Implantable, Wireless Vital Signs Sensor Suite," Medicine Meets Virtual Reality 15: in vivo, in vitro, in silico: Designing the next in Medicine, Long Beach, CA, 6-9 February 2007. Tan, R., "Minimally Invasive Implantable Wireless Vital Signs Sensor Platform," 17th Medicine Meets Virtual Reality Conference, Long Beach, CA, January 2009 (Oral). Tan, R., "Development of an implantable, wireless vital signs sensor suite," 9th Annual UC Bioengineering Symposium, Riverside, CA, June 2008 (Oral). Tan, R., McClure, T., Schmidt, J., Schulam, P., "Development of an implantable, wireless, and continuous pressure monitoring system," Joint Symposium on Nano-Scale Research into Biosensors, Biomaterials, and Nanotoxicology, California NanoSystems Institute, UCLA, March 2008 (Poster). Tan, R., "Development of an implantable, wireless vital signs sensor suite," 16th Medicine Meets Virtual Reality Conference, Long Beach, CA, January 2008 (Oral). Tan, R., Schmidt, J., Schulam, P., "Implantable sensors for continuous monitoring," Women and Philanthropy, Center for Advanced Surgical and Interventional Technology (CASIT), UCLA, November 2006 (Poster). Lin, CK, "The development of an implantable sensor network system for continuous measurement of obstructed renal pressures," PhD Dissertation, University of California Los Angeles, 2007.